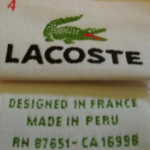 Before we start, though, if you are interested in authenticating a Lacoste bag, check out my article on detecting fake Lacoste bags. I’ve also written a detailed article on detecting counterfeit Lacoste items if these instructions are not good enough. 1) Check the logo – most fakes have bad logos with distorted lines and stitching. They also often use the wrong color thread. The crocodile should be dark green on a white patch, not the lighter green like the inauthentic logo shown below. The claws and teeth of the crocodile should be distinct, and its top jaw should be smaller than the bottom one. 3) Check the Logo Alignment – The Lacoste Logo lines up with the second button of their polo shirts. 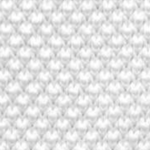 It never lines up with the bottom of the placket. This entry was posted in Lacoste, Real or Fake Lacoste and tagged Counterfeit, Fake, Fakes, Imitations, Inauthentic, Lacoste, Phony by JFP. Bookmark the permalink.